Summers are getting hotter and this is coming with a cost. 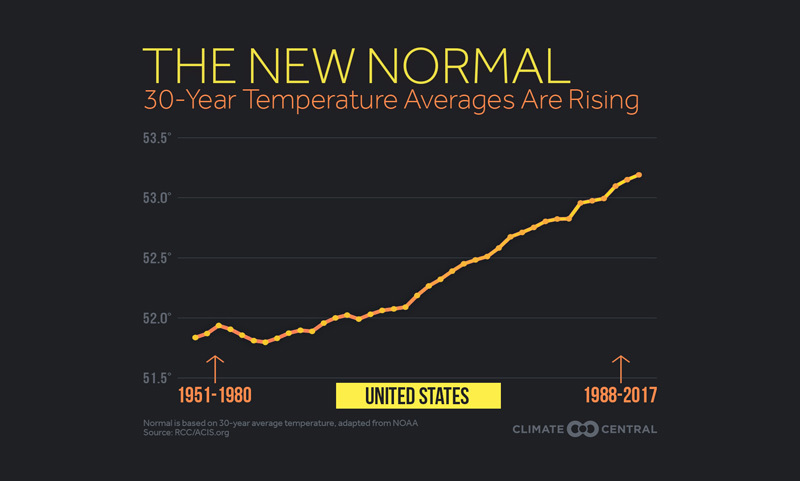 As greenhouse gases build in the atmosphere from the burning of fossil fuels, the number of hotter average and extreme temperatures continues to mount. 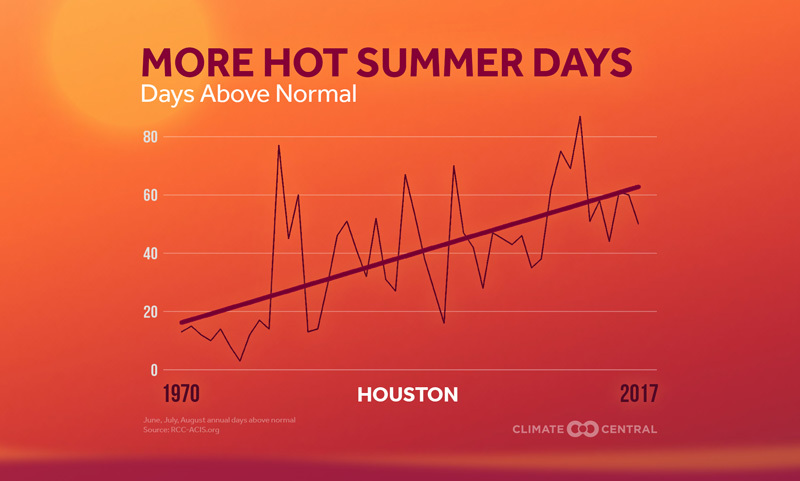 To better understand how this is impacting local communities, Climate Central analyzed trends in cooling degree days and minimum temperatures for cities across the U.S. in a special report The High Cost of HOT. Our study analyzed the number of nights each year when the temperature remained above 65°F (for cities that rarely experience nights above 65°F, we chose 55°F), which is an engineering temperature standard for keeping buildings cool. 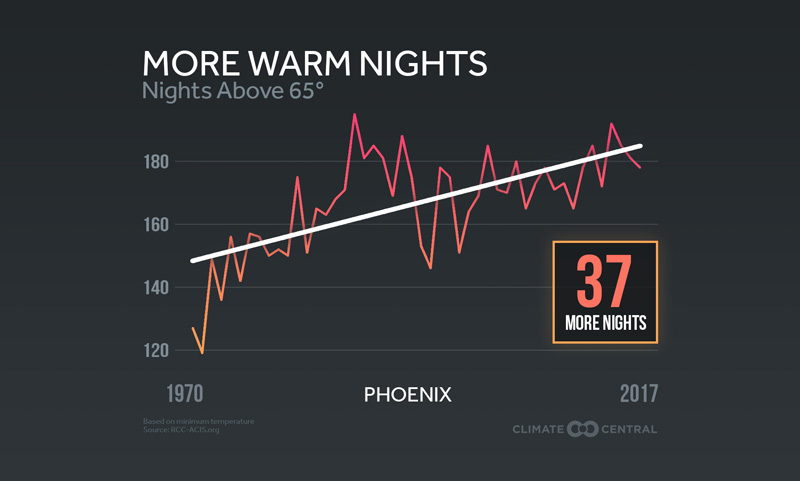 In our analysis of 244 cities across the U.S., we found that 87 percent are having more of these warm nights since 1970, with the biggest increase in the Southwest. Warming nights are driving the increase in average temperatures. According to NOAA/NCEI, overnight lows since 1900 are warming at a 20 percent higher rate than the daytime highs. Another way to measure the increase in heat is cooling degree days (CDD), which are used to determine how much cooling is needed to keep a building at a comfortable temperature. CDDs do not actually measure days at all. Rather, they measure the number of degrees that the daily average temperature is above 65°F. So if the average temperature for a day is 80°F, there were 15 CDDs in that day. 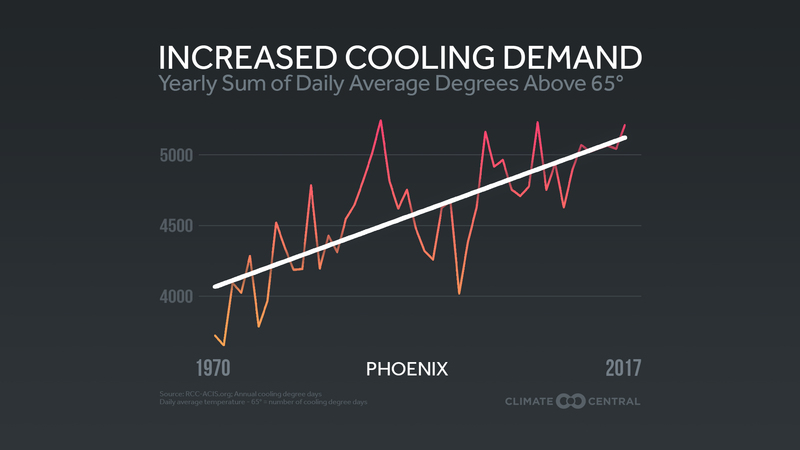 Some of the largest increases in CDDs are also seen in the Southwest, however CDDs are increasing sharply in places that traditionally did not need air conditioning in the summer months. For example, the number of CDDs has nearly doubled in San Francisco and Portland, Oregon in the last half-century. Cooling costs are rising as a result. Air conditioning already makes up the largest share of residential electricity use (17 percent) in the U.S., with Americans spending over $27 billion to cool their homes in 2015. The average annual cost for homes with air conditioning across the U.S. is approximately $250, but in the high use areas of the South, air conditioning costs are almost $450 a year. 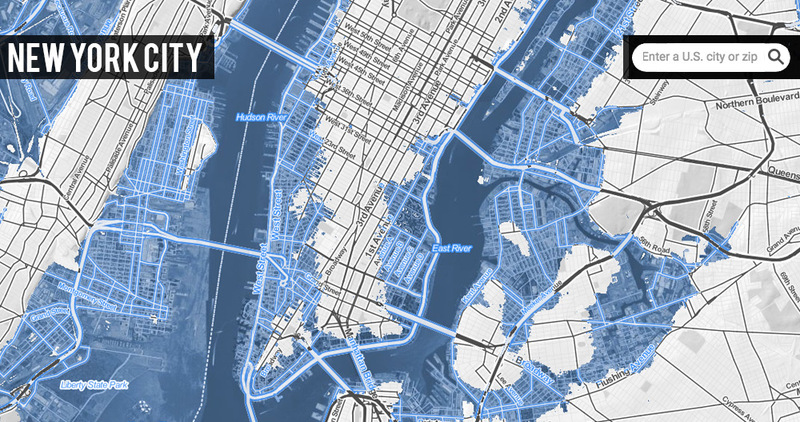 A 2014 Climate Central analysis of projected future summer temperatures shows that by 2100, New England summers will be as hot as current summers in Florida, dramatically increasing the need for artificial cooling. Hotter days also increase the risk of heat-related illnesses like heat stroke, and warming nights make it more difficult for the body to recover from the heat of the day. 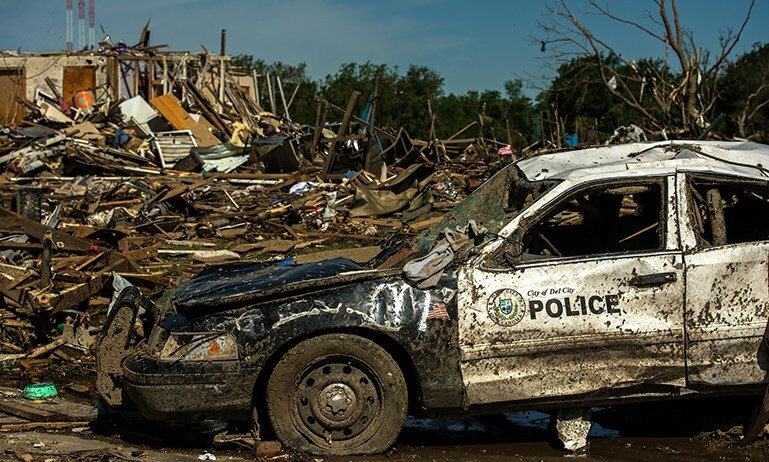 Heat waves are usually associated with stagnant air, which also increases air pollution and the vulnerability to respiratory illnesses such as asthma. For more, read our full report, The High Cost of HOT. 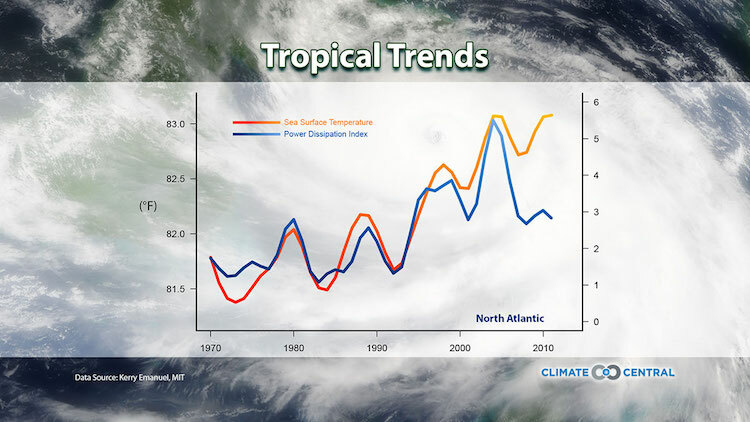 Methodology: Trends in minimum temperatures and cooling degree days were calculated using data from the Applied Climate Information System. Both analyses excluded years with more than 60 days of missing data. For the analysis of days with a minimum temperature at or above 65°F (or 55°F for cities that rarely experience nights above 65°F), we counted the total number of days with a minimum temperature each year at or above that threshold. Cooling degree days were calculated using the sum of the daily cooling degree days each year. Trends were estimated using R’s (programming language) simple linear regression model.